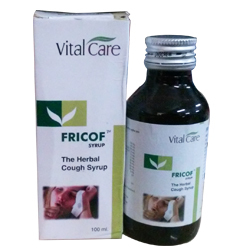 Fricof Syrup Treats Allergic & seasonal cough, smokers cough, prodctive & non productive cough. Allergic & seasonal cough, smokers cough, prodctive & non productive cough, and as an expectorant. Non-alcoholic & free form drowsiness. Ocimum sanctum (Tulsi) - 125 mg.
Adhatoda vasica (Vasaka) - 125 mg.
Glycyrrhiza glabra (Yashtimadhu) -	100 mg.
Clerodendron serratum (Bharang Mool) -	75 mg.
Solanum xanthocrpum (Kantkari) - 75 mg.
Terminalia belarica (Baheda) -	75 mg.
Zingiber officinale (Nagar)	- 50 mg.
Phyllanthus emblica (Amla) - 50 mg.
Piper longum (pipli) - 50 mg. Sat pipermint - 6 mg.
Curcuma Longa (Haldi) - 50 mg.